Complete the form below to register! 10:30 AM-12:30 PM, Sunday, May 15th. Come tour some of the most beautiful farmlands, woodlands, and wetlands of Saint Vincent with friends on horseback! 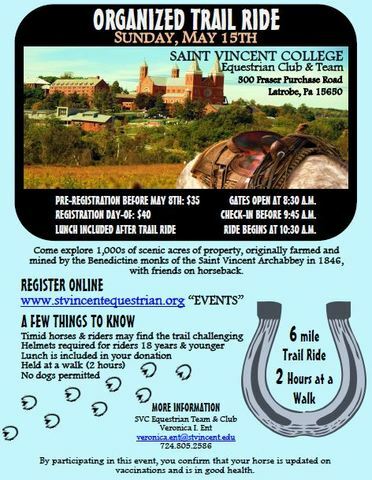 Join us and ride your horse through 1000 beautiful private acres of property originally farmed and mined by the Benedictine monks of the Saint Vincent Archabbey in 1846. The trail is 6 miles longs, and takes about 2 hours to navigate. The ride will be held at a walk. ​All riders are welcome. Dress is casual and appropriate for trail riding. Helmets are required for riders 18 years and younger. Trailer parking and facilities are next to the Saint Vincent spectator parking fields [College entrance off Rt. 30, left at stop sign (GPS: across from 500 Brouwers Road, Latrobe), right into parking fields] near the end of the old Fraser Purchase Road. Mounted riders to assemble at the trees next to the closed road end and field entrance at 10:15 AM. The ride will be held at a walk led by faculty and student riders. Landmarks will be announced during the tour. Ride may be divided in to flights pending the number of reservations. Lunch will be provided upon return. A $35.00 per rider donation to benefit the Saint Vincent College Equestrian Program will include lunch and approximately 2 hour ride. The trail ride is suited for the confident rider who is able to navigate his or her horse through areas in which are narrow paths and open spaces. Along the beautiful trails, riders will encounter road and traffic crossings, hills, trains, gravel roads, stream crossings, wetland drains, corn fields, abandoned roads, and large and small wooded areas. While held a walk, timid horses or riders may find the trail challenging. All riders must sign a separate release. This form will be emailed to the main contact upon registration. By participating in this trail ride, you acknowledge that your horse is up-to-date on vaccinations and is in good health.